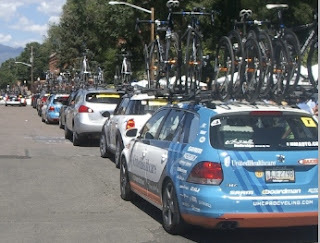 As the UCI deadline for license application passed on October 1st, the organization of teams for the 2012 cycling season is not yet known or complete. What is know is that 4 teams are applying for new World Tour licenses, some teams have not yet applied, 5 Professional Continental Teams missed the deadline, and most of the remaining teams are good to go for 2012. October is always an untidy month in the world of pro cycling with much left unknown. I always wonder why the teams miss the deadline with the UCI (is Jonathan Vaughters trying to make yet another statement). The reality is it takes time for the teams to finalize their financing and paperwork. Teams must submit to the UCI, sponsorship contracts, contracts with 12 riders, details of the team’s budget, a bank guarantee, and a description of the team structure. In 2011 eighteen teams were approved for UCI ProTeam license by the UCI. Twenty-one teams were approved for ProConti status, but only 19 teams have applied for Professional Continental licenses in 2012. We may see fewer Conti teams. The loss of HTC-Highroad and Radioshack will hopefully allow for World Tour licensing of Europecar and FDJ who missed out in 2011. A team is allowed to change their name and use the same license approved in 2011 if the license remains valid. For example the new Radioshack-Nissan team will be using the still active Leopard Trek license since the two teams have merged. The same applies to the revised Lotto, and Omega Pharma-Quick Step teams, when a Sponsor jumped teams. The new teams (GreenEdge Cycling Team, Lotto Cycling Project) along with the ProTeams which have asked for a licence renewal (Saxo Bank Sungard, Omega Pharma – Quick-Step Cycling Team, Katusha Team), as well as teams from the second division (Geox – TMC, FDJ, Team Europcar) and also those which are ranked between 16th and 20th in the ranking of sporting values (AG2R La Mondiale, Euskaltel – Euskadi) will automatically be called before the Licence Commission. The teams Vacansoleil – DCM Pro Cycling Team and RadioShack-Nissan will also be heard by the Licence Commission in accordance with article 2.15.071 of the regulations. Shortly after November 20th, the UCI will communicate a first series of decisions of the Licence Commission concerning the awarding of first division licences and registration in first or second division. The final decisions of the License Commission will be communicated on December 10th. Astana Pro Team (Kazakstan), BMC Racing Team (USA), Garmin-Cervélo (USA), Lampre – ISD (ITA), Liquigas – Cannondale (ITA), Movistar Team (ESP), Rabobank (NED) and Sky Procycling (GBR). World Tour - what used to be called the ProTour became the UCI World Tour in 2011. It is comprised of 27 elite male cycling events around the world. None of the races in the USA are on the World Tour calendar. (use a space between the 2 words). View a complete list of all UCI World Tour races. And the current World Tour rankings. ProTeam - in 2011 the teams that were approved to compete in the World Tour were renamed as UCI ProTeams (do not use a space between the 2 words). All ProTeams gain automatic entry into UCI World Tour events. UCI Professional Continental Team - these teams compete in the UCI Continental Circuit races divided into 5 specified zones around the world, and must be formally invited to compete in a World Tour event. The team is comprised solely of professional riders and must have 14 riders, 2 team managers and 3 other staff members in full employment all year. ProConti is the slang term used for these teams. UCI Continental Team - are governed on a national level and may comprise both professional and amateur riders who compete in continental races in their region. The nation under which the team is registered is the nation under which the majority of its riders are registered.